When we first viewed our pokey little townhouse in Alexandria 4 years ago, Senhor R was doubtful. ‘But we can’t cook in that kitchen!’ He said. But since I do the cooking, we took the house, and I took on the Corridor Kitchen as my personal challenge, determined to conquer it. As we move out now, I can’t say I haven’t bitched about the kitchen constantly; the lack of exhaust fan, the florescent lighting, the lack of bench space, the damp, the mould, the lino, oh yes, AND THE FACT THAT IT FLOODS EVERY TIME IT RAINS. Or did, until last month. But the fact is, I’m a much better cook than I was 4 years ago, and the kitchen is why. What follows are the top 5 lessons I learned from cooking in my Corridor Kitchen. Lesson One: Neccesity really is the mother of invention. If you have an ok kitchen with only a few irritating aspects, chances are you can let them slide – not quite enough cupboard space? Get rid of some stuff. Small sink? Grin and bear it. But if your kitchen is very basic, you will be making improvements. Constantly. And your creativity will know no bounds. We came up with an ingenious combination of hanging rails, hooks and magnetic strips to hold our knives and most used utensils. We bought a massive bookshelf from a law firm that went into liquidation to use as our pantry. Friends donated us a kitchen island made out of an old artist’s trolley. Lesson Two: lack of storage can actually be a good thing. It sounds completely crazy, but as I move into my new kitchen which seemed initially to have so much storage, it has become very apparent that the important thing is not how much storage you have, but the quality of that storage. A combination of visible and hidden storage. Prioritising items based on frequency of use. I found this post over at Small Notebook invaluable in our old house. 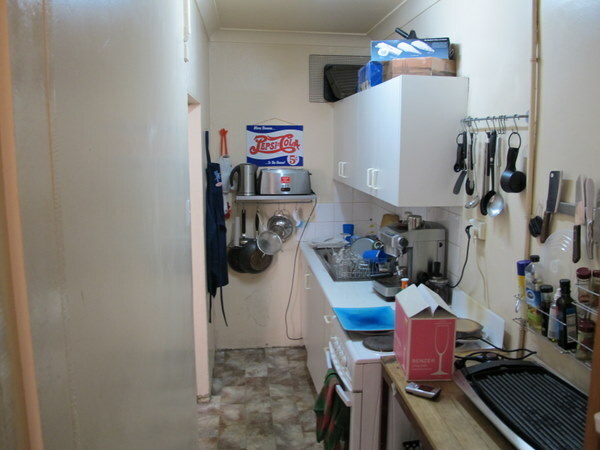 Lesson Three: The bench tops are always shinier in the kitchen next door. When I viewed the apartment we’re moving into now, I was blown away by the kitchen. But now that we’re unpacking our stuff, there are aspects of the Corridor Kitchen I’ve really come to appreciate. The massive pantry made of bookshelves, for example, or space for a bin. Although I know that not everything in the new kitchen can be perfect, I guess when I was working within the ridiculously rigid constraints of the old one, I figured that every kitchen out there was better than mine, in every way. But of course there are things about the new kitchen I don’t like. I’d rather have more cupboards than a dishwasher, for example. I crave more shelves inside the cabinets. Lesson four – I love shelves!! Shallow, open shelving makes everything visible and you always know what you have. I never really appreciated this until now. In our last place, most of our belongings were stored on shelves because there was no built in storage except for the kitchen cabinets. Turns out we can’t just throw all these shelves away and what’s more, in some ways they are actually better than ‘real’ storage. This is especially true in the case of food, where they make everything accessible and visible. Who cares if the outside of your olive oil bottle gets dust on it? Lesson five: ‘Useful’ items aren’t always that useful. Too many of a useful thing is still too many things! I’m looking around at our one million plastic containers and our one million pyrex containers thinking…what the hell do we need all these for again? Why do I have 4 frypans? What’s the logic behind out two sets of cutlery? I guess I assumed that because we had limited space in our old kitchen, everything in there must have been necessary. But of course that’s not the case. When there’s space we tend to fill it – you never find an empty kitchen drawer. What about you? What lessons have you learned from your kitchen? * When my Dad came to stay he was pretty worried we’d end up electrocuting ourselves.